I’m launching a series of memes as conversation starters on social media (namely, Facebook and Twitter) with messages that are relevant to the subject matter of my memoir this month, which marks the one-year anniversary of my book’s release. It’s my way of drawing attention to how we all need to “turn to, not on,” each other with respect and dignity. Creating a world in which we accept and embrace sexual diversity can make a difference and encourage individuals to come to terms with their sexual identity early on. Here’s the first meme (image credit: Pexels.com). What do you think? I’m delighted to introduce you to the “In The Ladies’ Room with Dr. Donnica” podcast series, hosted by Dr. Donnica Moore. She dares to explore a wide range of topics related to women’s health and all things personal with an open mind, a sense of adventure, and a sparkling personality. You can learn about my own memorable experiences in the ladies’ room during the first 5 minutes of the podcast. Then follow the twists and turns of our hour-long conversation to discover how it all turns out. I recently crossed paths with this splendid picture book written by Gayle E. Pitman, illustrated by Laure Fournier, and published by Albert Whitman & Company (May 2018). Available at your local bookstore or via amazon. I fell in love with this book at first glance. It’s fun to flip through the pages and find an image that resembles your own loved ones. Yes, images include people wearing sunshine yellow clothes (my favorite to color-coordinate with my own book cover). When book groups ask for the inside scoop, I’m happy to talk about my book title, cover design, and more about my memoir writing journey. Photo by Hannah Kerwin, May 2018. Walking into a room full of people who have already read my book and want to talk about their reading experience is pure bliss! 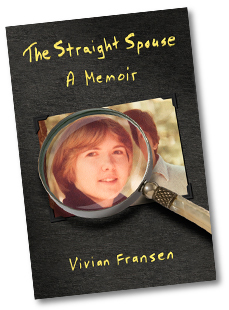 What are three adjectives to describe your experience reading The Straight Spouse: A Memoir? Was there anything you found surprising about this love story? Did this book help you develop empathy for the person who is married to someone who struggles with sexual identity and turns out to be gay? Was there a specific scene or passage from the book that has left a lasting impression on you? What are some of the “loose ends” or unanswered questions you have about this story? Did reading this book make you think any differently about the subject matter? Would you recommend this book to other readers? Yes, many people still love to read books, including memoirs. I’m always on the lookout for opportunities to make author visits to book groups. I listen carefully to what readers have to say. Everyone has something important to share. Book readers are the best kind of people to hang out with these days. Blessed are they who participate in book discussion groups! Yes, I bring my book along wherever I go! I’m delighted to share some good news: I was the featured guest on the hour-long Mental Health Matters, a local program co-hosted by Tracy Ecclesine Ivie and Larry Cartwright on Monday, March 5, 2018. Special thanks to the Hunterdon County Chamber of Commerce for its support over the years of this award-winning Mental Health Matters program! Yes, I color coordinate with my book cover by wearing sunshine yellow. Photo by Gemini Universal LLC, March 2018.